Three New Commissioners Sworn In. Welcome to Commissioners López, Collins, and Moliga! We welcome three new board members elected in November: Commissioners Alison Collins, Gabriela López, and Faauuga Moliga. At this time one seat on the SFUSD Board of Education is vacant, awaiting an appointment by Mayor Breed to fill the seat left open when Commissioner Matt Haney was sworn in as a city supervisor last week. It is not official until the Board of Education votes! Election of board President and VP and assignment of members to committees. 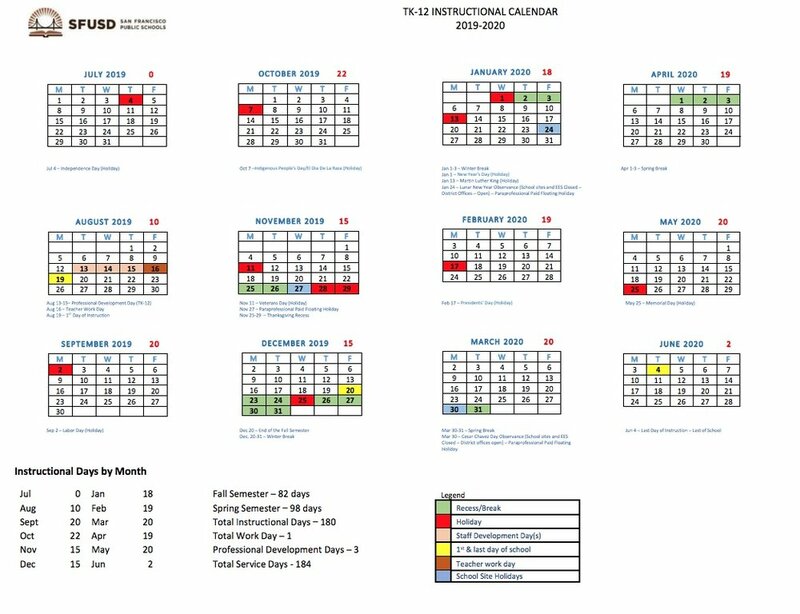 Vote on proposed SFUSD instructional calendars for 2019-2020 and 2020-2021. Both feature school start dates in the third week of August and last day of school in the first week of June. Vote to approve the SFUSD’s fiscal year 2017-2018 audit report. Want to check out the report? Here it is. Update on Safe and Supportive Schools policy resolution adopted by the board in 2014. The goal was to shift the culture of discipline towards a focus on improved school climate, use of Restorative Practices and Positive Behavioral Interventions and Supports (PBIS) across the district. The policy also aimed to reduce rates of suspension, expulsion and out of class referrals, and in particular decrease the disproportional impact these practices on some student groups. The report should included data showing trends in rates of discipline and also rates of chronic absenteeism, which is sometimes used as a measure of school climate. Creative Arts Charter School petition for renewal through 2024 will be introduced. The petition will be discussed at one or more committee meetings before coming back to the full board for a vote. One goal of the Safe and Supportive Schools policy, on the agenda this week, is to end disproportional rates of suspension.